Ever wondered what FIA and Snell have in common? What do those numbers mean anyway: 8859 or SA2015? FIA, based in Paris, is the International Automobile Federation (Federation Internationale de l'Automobile to be exact). Everything international racing, they control. Consumers and drivers like us now have one place to look for race classifications, specifications on race-car standards, or more importantly, safety requirements. They are in theory the racing rulebook. Who is Snell, and what does SA even mean? 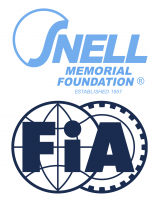 The Snell Foundation was founded in 1957 in memory of William Snell, who passed in '56 after a helmet failed to protect his head. From '57 forward, the organization (a non-profit) was formed to research safety standards and establish certifications for all motorcycle, bicycle and automotive racing helmets. M designates motorcycle standards and SA is for automotive racing helmet certification. The US does it a bit differently or you can argue that the international group didn't quite trust what those Americans are up, but the result is the same: navigating which standard you need in the US can be a bit trickier. So now that we've got the basics out the way, let’s talk about what might matter most to you. Snell SA2015 - Snell approved automotive racing helmet that has passed for use in racing. These helmets are tested for “low velocity” impact as well as “low lateral” impacts to side window frames as well as chassis structures. They also must have a HNR (Head Neck Restraints/ HANS) capable system within the helmet shell. A sticker like the one pictured will be on the inside of the helmet. FIA 8859-2015 - Helmet that passed FIA helmet testing with correlation of the use of a Head and Neck Restraint (HNR) device such as a HANS. The difference between the FIA8859-2015 vs the SA2015 is that these helmets were tested with specific M6 terminal thread HNR post as well as stricter specification on helmet standards. They require max weight of 1800g for full face and 1600g for open face. On top of weight they require chin straps to be mounted on the helmet in a way that cannot be dismounted without destroying the anchor points. The pull tab for the D ring fastener also cannot pass more than 7mm. As a “premium” helmet they require both SA2015 testing procedures as well as FIA certification. You should see a sticker or tag on the helmet like the one pictured for these helmets. FIA 8860 - The most updated standard for helmet safety technology after the 8859 homologation. It requires a test of a single impact in the 5 meter range to conform to shell standards needed for certification. These helmets were formed with F1 to increase driver safety and helmet performance. The 8860 helmets are also Snell approved as well. The FIA homologation for 8859-2015 requires a demanding test post Snell approval. These helmets are conformed to a higher standard with additional reassurance for safety. Even though SA2015 helmets are a very safe helmet, FIA didn’t believe Snell testing in 2013 met their safety standard , thus leading the 8859-2015 certification. The 8860 helmets on the other hand is the cream of the crop. They are considered the safest and modern helmet available today. They were developed with F1 to emphasize in modern helmet technology and driver safety. Simply it is the best homologated helmet available for purchase. There aren't many on the market and once you hear F1 attached, think $$$. They're extremely expensive. Don’t worry, helmets meeting both SA2015 and FIA 8859 do exist. Many companies, including Bell and Arai, meet both Snell standards as well as FIA homologation with models like the Bell RS7 Racing Helmet BEL-RS7 Select Options or Arai GP-6S M6 Racing Helmet ARA-GP-6S Select Options . Next time you purchase a helmet, do some quick research on what your class rules state, so you won’t be left on the paddock. In general, Snell SA2015 helmets are the most cost effective and all you need to go racing in the US. The FIA 8859-2015 helmets we sell are all Snell approved, so if you think you might go abroad or participate in a US race which requires FIA, then go for one of these.